Sometimes known as "Popcorn Tea", Genmaicha combines a Banca green tea with toasted rice and popped corn. 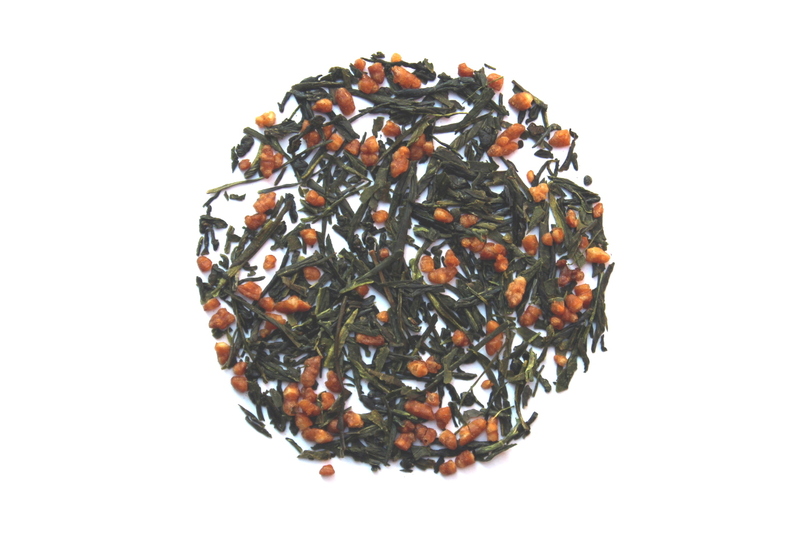 Genmaicha has fresh notes of green tea and the aroma of toasted rice. When I first got this tea, I was like huh thats an interesting combo and didn't think I would like it...but OMG it is maybe one of my favorite teas EVER!! Just add some honey and you have a wonderful tea for the morning or afternoon. something about the popped corn and rice hulls changes the flavor to something I can't even describe. It's sooooo good. I'm a green tea fan but this one is really unusual. It's like a soothing rice tea - such a pleasant, mild flavor. The rice is there but not overpowering. I have been part of the sampler club for over a year and although I enjoy most of the teas, I only very occasionally log in to buy more of any particular tea. With this one, I did. I first had this tea at a restaurant and couldn't help but notice how different and delicious it was from the normal green tea you usually get. I forgot to ask, though, what kind of tea it was. So I was so excited to receive it in the subscription box! I finally know my favorite kind of green tea. This tea has a nice toasted, nutty, slightly sweet flavor that makes me think of roasted chestnuts. Can't wait to drink my next cup! I received this flavor a few days ago and finally got to try it today. It smells delicious, both in the packet and brewed, like rice. It tastes very light, with hints of the popped corn. Probably now one of my favorite teas. I'm a big green tea drinker so I might be biased, but I also don't think this tastes like your average cup of green tea so maybe not. Will definitely be buying more when I run out! This blend reminds me of something from home (Southeast Asia). I couldn’t taste the popcorn much in the blend but I can definitely taste rice in it. The rice taste is like a toasted rice, more like a rice drink. It was nice.